Hemingway’s writing changed the landscape of American fiction, but his persona and way of life make him even more captivating than his most iconic characters. It’s no wonder why he still fascinates the world 56 years after his death and why he still continues to show up in books and on film. As we continue with Hemingway Week, I wanted to talk about one of my favorite novels, Hemingway’s Girl by Erika Robuck—a novel that prominently features Papa, and does so beautifully. 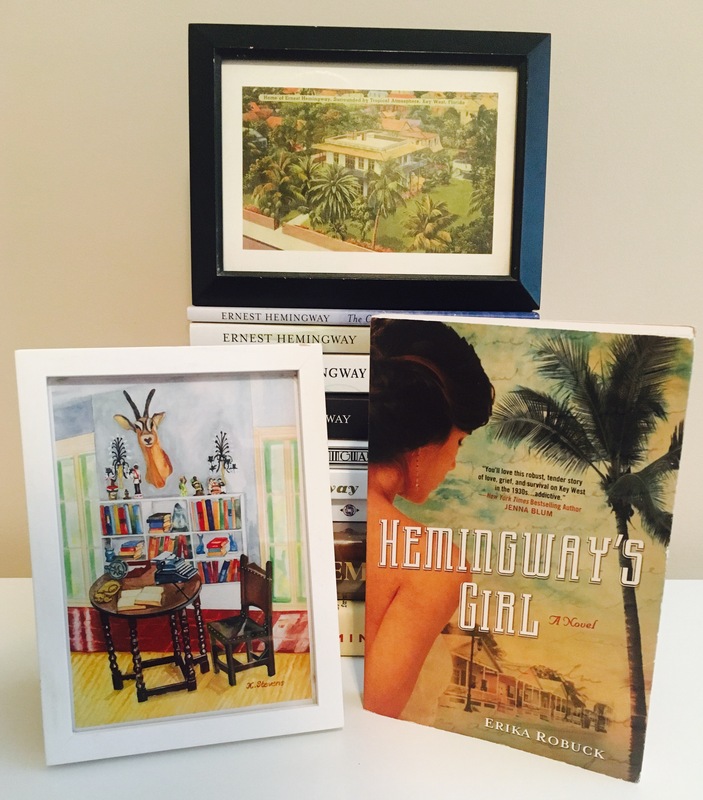 Hemingway’s Girl transports us to Key West, 1935, and introduces us to Mariella Bennet, the nineteen-year-old daughter of an American fisherman and a Cuban woman. After her father’s death, Mariella finds herself the provider for her family, doing whatever means necessary to support her mother and younger sisters while trying to start a business of her own. When she is given the opportunity to work as a housekeeper for Ernest Hemingway and his wife Pauline, Mariella’s world is suddenly filled with star-studded dinner parties, off-island excursions, and the contentious theatrics of her employers’ rocky marriage. While building something of a father-daughter bond with the famed writer, Mariella begins dipping her toe into a relationship with WWI vet Gavin, who is on the island working to build the Overseas Highway. Straddling the line between two very different worlds and two very different men, Mariella’s time with the Hemingways calls into question who she is, who she loves, and who she will become—all of which gets put in jeopardy when a massive hurricane comes barreling toward the Keys on Labor Day. With such a larger-than-life personality, fictionalized accounts of Hemingway can be tricky, but Erika Robuck tackles the challenge with care and accuracy and the result is sheer perfection. Owning that Hemingway was an icon not only in the literary world but as a figure on the island, he’s brought to life on the page with an air of mystique while still remaining a mere mortal. We get to know him right along with Mariella as a human being—a man with flaws and good qualities all rolled into one, a man who, even with his faults, could be so easy to love. To a longtime Hemingway fangirl, everything about his depiction just feels so true. One of Erika Robuck’s finest strengths as a writer is bringing together legendary figures and fictional characters, and making those fictional characters just as compelling as their famous counterparts. I read Hemingway’s Girl nearly five years ago, when it was first released, and Mariella and Gavin remain just as vivid to me as Papa himself. The sights and sounds of Key West shine through in every chapter, and the weight given to the Labor Day hurricane of 1935 gives light to a tragic, little-talked-about event in history. If you love Papa or even just love Key West, there’s no question—you must read this book. But the beauty of Hemingway’s Girl is that you don’t have to be a Hemingway fan or even know a thing about him in order to fall in love with the story and its characters. You’ll without a doubt want to read all of Erika Robuck’s other books in quick succession, and maybe, just maybe, some Hemingway too. For more on Erika Robuck and her fascinating tales of Zelda Fitzgerald, Nathaniel Hawthone, and Edna St. Vincent Milay, visit erikarobuck.com and connect with her on Facebook and Twitter! I cannot thank you enough for this. I am so grateful. Thank you!! You’re so very welcome, Erika! I’ve loved this book since it first came out. It instantly became a forever favorite. From one Papa fan to another, thank you for this beautiful story!